CLICK HERE for the same Podcast outline. Sam studied Ethology at the Agricultural University of Holland… where she received her Master’s of Science (MSc) degree in 1998. From there she specialized in dog behavior and training. In 2006 she founded her own dog training facility Paws4Fun. 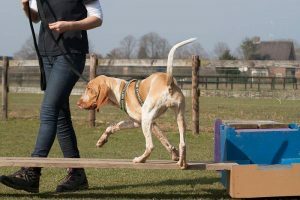 Always wanting to continue learning and teaching she is always in search for more information by attending conferences and seminars.In 2012 she developed Proprioception training for dogs in The Netherlands. This has resulted in a puppy, adolescent and senior programme in the form of workshops and courses. 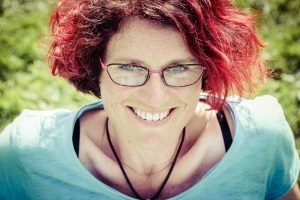 Teaching is a passion for Sam and in 2013 she started an instructors course on Proprioception training as well as an online learning environment (Clicker Training Academy). The latter is not active at the moment but there will be more online learning coming. 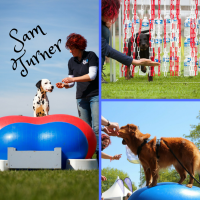 She gives lectures and workshops for professionals in the pet and sports dog industry on the subjects of clicker training, puppy development, adolescents and proprioception training in different countries (Scotland, England, Belgium, Denmark, Iceland, France, The Netherlands and Australia). In June 2016 she was a speaker at the IMDT (Institute for Modern Dog Trainers) conference for dog trainers and dog behaviorist’s and she has just returned from the Animal Training Symposium in Perth, Australia where she was a speaker. In October 2017 her fourth of a series of books was published in The Netherlands. The series title is ‘Your dog physically and mentally in balance’ focusing on different developmental stages in dogs (pup, adolescent, adult/senior) and the fourth book is about the dog as athletes. Additionally, Sam has written several articles on dog behavior and clicker training for the Dutch website doggo.nl and has published an article in the Spring 2017 issue of the APDT quarterly magazine The Chronicle of The Dog. There will be more books to look forward to as well as Sam has started writing about puppy and adolescent development as well as proprioception training in English. CLICK HERE for the Veronica Boutelle episode – talking about running and starting a dog/animal training business. CLICK HERE for the Carrie Kish episode – talking about training enrichment with ectotherms; reptiles & snakes. CLICK HERE for the Jim Mackie episode – Animal Training and behavior officer, the Zoological Society of London. Listening to Sam Turner’s conversation with Ryan was the highlight of my week! This is more fascinating information and insights, adding to what I’ve learned about wraps and groundwork in Tellington TTouch training. Hope I can attend a workshop Sam is doing someday, somewhere. Thank you!